For those of you that know me, you know I love food. My first job was at a local cafe in Freeland, where I learned my way around a kitchen. I followed the culinary career path for awhile, working in several different restaurants until I became Executive Chef at a BBQ joint down in Portland. Eventually, I pursued my career in marketing and left the Restaurant business behind, but I still have a love and passion for good food, good atmosphere, and good service – the 3 things that make a great restaurant. Located just 3 doors down from the Historic Coupeville Wharf, Front Street Grill is the perfect place for causal dining in a warm atmosphere. Bring your whole family for Weekend breakfast, lunch, or dinner. Their menu includes vegetarian and gluten free options, as well as a kids menu. The menu at Christopher’s is small, but foolproof. Anything I have tried here has always been delicious. I’m a bigger guy, and the portions are so generous, even for someone with a large appetite like me that I can count on taking something home to enjoy later. The prices are very good for the food you receive. Chef Andreas uses just the right amount of garlic, cream and white wine in his sauces. 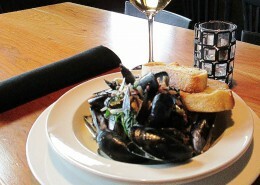 If you are looking to try the famed Penn Cove Mussels, this would be my first choice! Other highlights include the Bacon Wrapped Pork Tenderloin, and Raspberry Glazed Salmon and Wild Rice. The moment you enter the rightly named Frasers Gourmet Hideaway, you will notice an attention to detail and a feeling of pampered senses that continues throughout the evening. I’ve been here twice and it was a truly high-end dining experience each time, with food and service both among the best I have had the pleasure to enjoy. Opened in July of 2006, Frasers Gourmet Hideaway immediately has a strong client base of locals and tourists alike that continue to name the restaurant a hometown favorite. This restaurant has received some local and national press for the quality of food they serve. Decor includes rich wood floors, plush leather chairs, and golden light from blown glass sconces and chandeliers. The look is sophisticated, but casual all the same. Frasers features a dramatic open kitchen where guests can enjoy the lively ambiance of the dining room or cozy up to the action at the illuminated onyx chef’s counter. Executive Chef Scott Fraser graduated from the French-focused Pierre Dubrulle Culinary School understands the importance of food. He creates a seasonal menu that takes advantage of the freshest local ingredients and promotes the bounty of the Northwest. The menu is awesome, offering something for everyone, and every single item is so damn good I can’t even put it into words. Kim Bailey, the Executive Chef and Owner really does it right, extremely high quality standards so every time you eat here the quality never suffers, no matter how busy they get. If I lived in Seattle, I would hop on the ferry and walk up the hill out of Clinton just to eat here. If you’re on Whidbey, you gotta stop here. They even serve beer and wine…at a deli. Perfect. As the name suggests, the atmosphere at Rustica is visually warm and inviting, with a décor that has a rustic influence. When they built out the space, they used re-claimed, locally harvested, ancient woods for the front entry double doors, as well as the huge slab wood bar and vertical wood slats on the walls. It truly was a labor of love and artistry when they created this space. No cookie cutter corporate touches anywhere here. Oh, and the stippled copper wall covering behind the bar is so cool! Serving locally sourced (whenever possible), seasonal farm to table ingredients, Rustica has an Italian-Mediterranean-Spanish inspired menu. Quite a sumptuous combo! With this rich and diverse foundation of culinary traditions, Rustica serves up very creative menu options. You’ll likely find dishes and flavors here you won’t find anywhere else on the island. They’ve chosen some diverse wines from around the world to accompany the flavors infused in the food they serve, so if pairing a wine with your food is a consideration, I think you’ll be pleased. From light fare to filling full course dinners, starters to desserts, Rustica is a favorite. Chef Gordon is known by many for his exquisite ability to layer flavors, and create delectable combinations, all while producing beautifully-presented meals with a simple elegance. That reputation is well deserved. Your meal at Gordon’s is sure to be one of the best you’ve ever had. In addition, with a farm-to-kitchen philosophy, Gordon works with several local producers to provide fresh local ingredients, supporting community while providing the very best in fresh seasonal fare. Gordon’s offers happy hour and small plates as well as a full bar. Service is always top notch, and atmosphere is always nice, as long as you get a good table. Chef/Owner Linda Coffman has carefully selected everything you’ll see on the menu, and her attention to detail shows through. She’s added a bit of Northwest fresh flavorings and accents to centuries old recipes, and the result is quite wonderful. All sauces, dressings and desserts are made in-house. They also offer a limited selection of vegetarian and gluten free items. Entrees include what you’d expect, and hoped for…pasta, gourmet pizzas, hand cut rib eye, seafood and more. 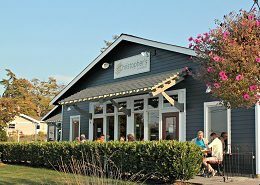 Sunday brunch at Charmers Bistro is well worth checking out. While the menu may change, it has featured a seafood tower salad with tomatoes, avocado, Dungeness crab and prawns, leading to tantalizing entrées and desserts. Quite decadent! This is a South island favorite! If you’re looking for good Chinese food and a nice atmosphere, you can’t go wrong with either of their two Whidbey Island locations. China City has an exceptionally wide selection of American Chinese cuisine. Included in their menu are excellent entrees for beef, pork, seafood, and chicken. They also offer complete dinner combos for the whole family. In addition, they offer a variation of traditional Chinese dishes that include chop suey, egg foo yong, mei fun, chow mein, vegetables, tofu, and rice. Both locations offer a full bar, with happy hour drink and food specials. Yup, it is good ol’ fashioned Texas BBQ, as well as Carolina style and Pulled Pork to boot, great sweet cornbread and when in season, the Greens, oh the greens… And all the fixins for sit down or take out. Tim and Sonna Ryan have been serving up BBQ on Whidbey Island since 2006. They make all their own rubs, sauces, side dishes, cornbread and desserts. They hand select the best cuts of meat on the market to smoke slowly over Hickory for up to 15 hours in their Southern Pride Smokers, Big Daddy & Little Mama.